'My Little House Cookbook' is the cutest! With quaint, old timey recipes like popcorn and milk. WHAT?? What is that even about? Has anyone ever tried that? Is it good? 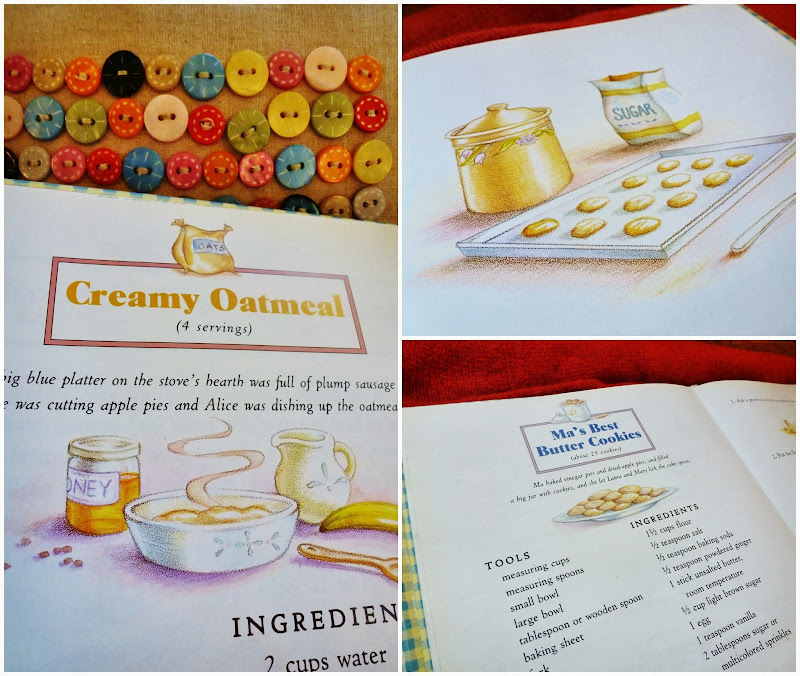 You'll notice I'm not stepping up to say that I tried that recipe.This is a very simple book for kids, with simple little recipes that child can easily handle in the kitchen with an adult supervising. What I did try was the recipe for Little Maple Cakes, and you can come back later this week to see the recipe for that. Ha ha ha ha, way to milk one blog post into two eh Melissa? You betcha! I went through a long run of being obsessed with pioneer food. I also checked out 'The Little House Cookbook' which is for older readers or adults, and gets really in depth as to the ins and outs of pioneer food, with harder recipes and more intensive discussions about food preparation in Laura Ingalls Wilder's day. Get ready to find out all about hog butchering! I was fascinated by that book in particular, but do I have a photo? No, the library needed that one back and I didn't get it photographed. But you should totally check out that book, especially if you are a Laura fan and a foodie. I have the Little House book too! Just got it a few weeks ago from a lot of used books. Such a cute cute little recipe book! I haven't tried them yet but I am in love with the illustrations! I wanted to purchase the other book for adults but I wonder how much I would need it. I would frankly much rather buy The Joy of Cooking book for a start since I need a good recipe book that I can use daily! Oh how cute. I would love this book. Thanks for sharing. ok I am so addled these day and we had the books for over 2 months and I think there was a pancake recipe but I CAN'T REMEMBER. Oh dear. A photo shot of the table of contents would have been useful, yes? I read somewhere once that early settlers ate popcorn with milk as a breakfast food just like we eat cereal and milk. why not? Can't taste any worse than cornflakes. I love the idea of this book for cooking with kids. I wonder how genuine the recipes are? Thanks for sharing! That second book that I linked to? The one for adults? Those are the real deal recipes, as far as possible. In this one, the recipes are based on real Laura food references, but updated for a modern audience, I believe. That is so cool! I still have the boxed set my mom got me when I was in elementary school ... almost 25+ years ago! i still have my original paperback Little House box set as well!!!! !